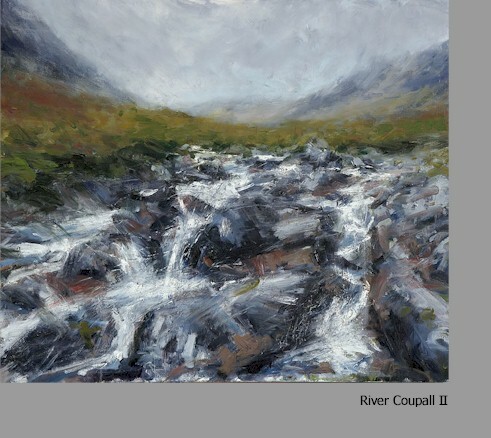 Through a process of walking,drawing and painting directly in the highland landscape and working repeatedly in different places chosen and revisited many times Jonathan Shearer has developed an intimate connection with the wild places of Scotland. I hope to convey the changing seasons in the highlands. The hue of the earth through wet and dry days, the gathering and fleeting clouds working their dramatic transformation on the mountains, the play of the elements in the wild places. " Speed is essential when working outside –if you spend too much time on a sketch or painting, you lose the sense of what is happening. I like each painting to be readily identifiable to the particular location, yet equally it must be true to my feelings and response, which I think gives it an integrity. Consequently the result won’t necessarily be an exact representation of what I saw. And although my aim is to capture the moment, conversely I also think there is a timeless quality about such scenes. Generally my subjects are wild places, away from the obvious tourist spots. Ideally, I look for landscapes unaffected by man, although with forestry and other activities that sort of primeval landscape is increasingly difficult to find .Occasionally I do include man-made elements–perhaps the remains of a stone wall, a croft or some farm buildings–and these create a telling sense of scale within the vastness of the landscape. But what I prefer is that feeling of isolation; of being submerged in a landscape that has a resonance of history, although perhaps no visual evidence of mankind. I need to get to know a place before I can paint it and initially I spend a lot of time walking, looking and contemplating. Also, I like to revisit locations at different times of the year and in different weather conditions. The weather is a major influence in my work and usually I am looking for something dramatic. If it is a calm, sunny day I tend to find it a bit bland! I have also painted in other remote areas of the country, including the Yorkshire Moors, as well as in Andalucía, Spain."